I had been at an auto auction way out in Georgia’s Deliverance country. The accents were thick, the bidding action was surprisingly thin, and a 2010 Ford Escape Hybrid stood in all of its squarish two-ton glory on the auction block. That didn’t last. Before I knew it another two bidders quickly jumped into the fray and $3,000 quickly became $3500. I hit it on $3600. My nemesis winked at $3700, and then I decided to do the one thing most folks are scared to do at an auction. I put my bid in at $3800 right when the auctioneer had been ready to slam down his two-dollar gavel. That pause gave enough pause and doubt to the other guy and for $3800 it was mine. All mine! BWA-HA-HA-HA!!! A hybrid SUV that is two model generations old, I think, and has close to 150,000 miles. 149,602 to be exact. These were red hot, until they were not. 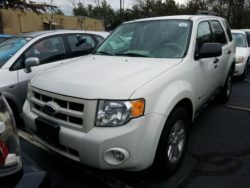 Back in 2010 this Ford Escape was brand spanking new and nearly $35,000. Gas was high again, and this particular model was doing battle with other compact SUV two-ton heavyweights like the Honda CR-V, Toyota RAv4 and Nissan Rogue. Those guys offered 20 miles per gallon and maybe a little change if you were lucky. This one offered over 30 miles per gallon and all-wheel-drive which is admirable now and nearly jaw dropping back then. Everyone reviewed it (here, here, and here). Most liked it and so the hybrid version found itself selling right close to the MSRP, for at least a while. Then the newest that was then gradually became the oldest in the marketplace. Gas plummeted. Most of the competitors embraced an aero-look that had already been a mainstream presence since way back in 1999 when Lexus first released the then not-quite-an SUV-but-damn-distinctive RX300. 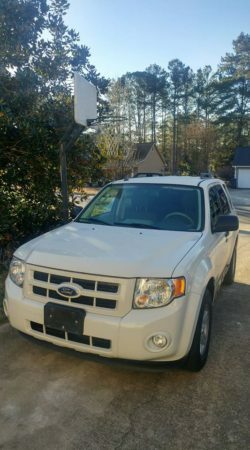 This generation of the Ford Escape became a free-falling commodity in the used car market, and rental fodder nearly everywhere else. Hyrbids are still selling for less than their conventional gas engine alternatives in nearly all market segments in the used car world which is why I was able to buy an SUV with about 40% of its life left for roughly just over 10% of its new car price. My neighbor across the street gawked at this car at least twice within the first 24 hours I had it on my driveway. I knew he wanted it. For nearly two years he has been asking me to find a small (to him) SUV that let’s the rear gas be popped open so that he can easily chuck his gym clothes and lawnmower in the back. In the meantime, he had been schlepping around town in a 1996 Toyota Tacoma that he had since new. That one now had over 325,000 miles. That’s right. He does an awful lot of schlepping during the day. It took roughly two years for me to hit what I call the plated double-nickel. That’s when you buy a relatively late model vehicle, usually between six to eight years old, that you can retail for $5500. 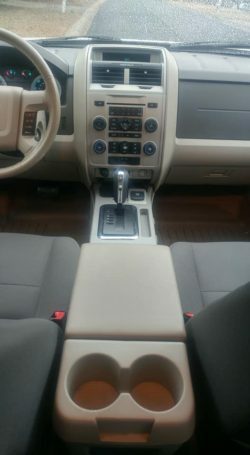 This 2010 Ford Escape Hybrid represents the absolute edge of that opportunity. The folks who owned it had kept it garaged and the interior still looks almost showroom new. But… there’s a couple of maintenance issues. First off the tires. My neighbor will be waiting for President’s Day this February when the nearby tire shop will be offering about $180 off a set. I’ll be getting them and he’ll get my well deserved discount that comes with making that place rich during the course of the year. A site called Bob Is The Oil Guy highlights those discounts at a forum you can find here. It will also need the 150k service which costs more than the usual basic maintenance… but not a killer interval. The coolant for the gas engine and the hybrid battery will both need to be replaced and the oil and air filter will need to be taken care of as well. That’s about as hairy as it’s going to get when it comes to maintenance. Once this car is in Day One condition, I’m sure it will last anywhere from 100k to 150k. Atlanta has no rust and very smooth roads. You do get some trade-offs with venturing to the discount bin of the 2010 and newer side of the used car market. The safety and fuel economy are excellent, but a rear view camera and infotainment are non-existent. The seats are great, but the dash and door panels have the texture of thick plastic. What’s hard today was soft back then and gizmos weren’t quite as icon-based so what you end up with is buttons all over the place. That’s doesn’t bother my neighbor. He will be selling his Toyota truck for around $2,000 during tax season and will likely have around $7,000 in a hybrid SUV that is 11 years newer and has less than half his truck’s mileage. For $5,000 it’s one hell of an upgrade.